Editor for TileLetter, TileLetter Coverings, TREND and TECH publications. Lesley Goddin has been writing and journaling since her first diary at age 11, and drawing and sketching since she could hold a pencil. Her penchant for observation led to her becoming a paid professional as a trade journalist, publicist and is editor for TileLetter. She has also written for Guideposts, Walls, Windows and Floors, Floor Covering Weekly, and Low Carb Energy. 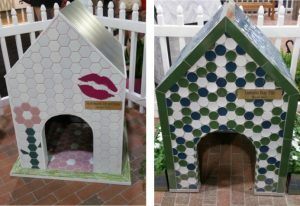 Coming soon to the Orange County Convention Center is the 30th edition of Coverings! 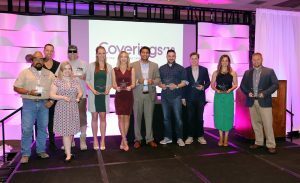 That’s right, this year Coverings ’19 returns to Orlando bigger and better than ever. 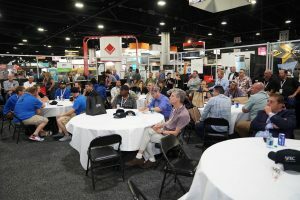 It’s your chance to prepare and take advantage of the astounding and abundant opportunities for education, inspiration and networking that make up the heart of the Coverings expo. To get ready and view an overview and floor plan of the show floor, schedule of events and Conference Session, awards and other aspects of the show, go to www.coverings.com. 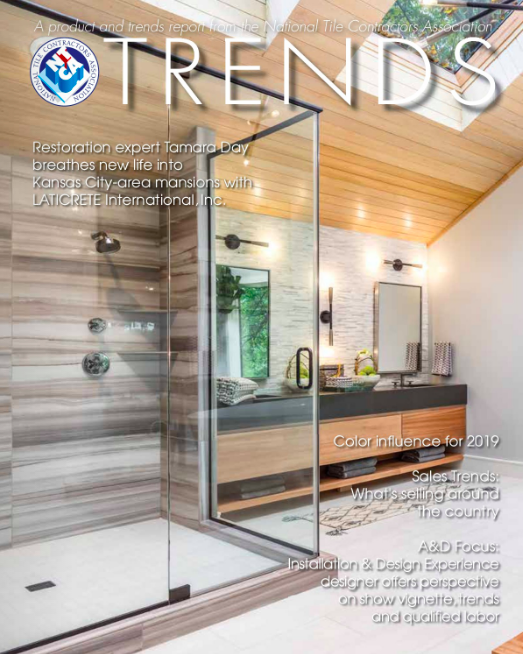 This issue gives you a sampling of upcoming events planned by Coverings show owners – Ceramics of Italy, Tile of Spain, Tile Council of North America, the Ceramic Tile Distributors Association, and the National Tile Contractors Association. 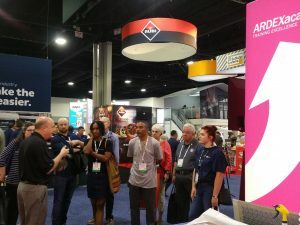 Take a look at highlighted educational sessions and demos pertinent to your visit as well as lists of exhibitors who have the products that you seek. 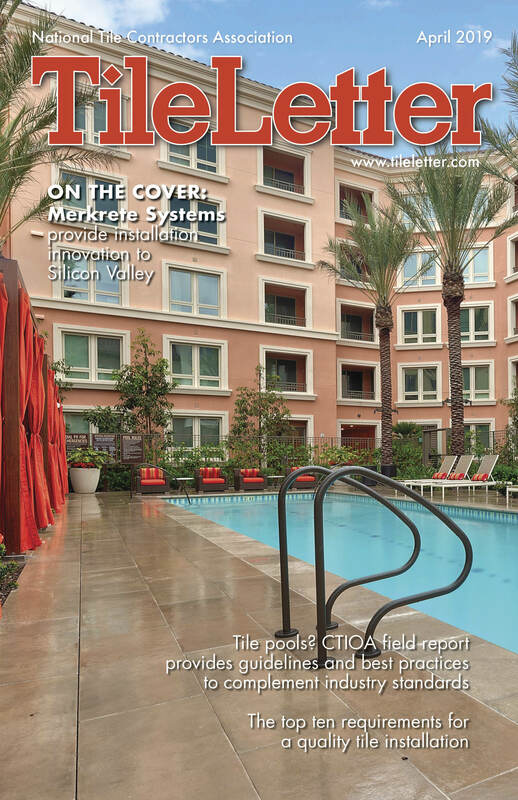 While you’re searching for products, read this issue’s Tech Talk section, which surveys tile contractors for the tools most important to their businesses. It might give you some ideas of items to search for at Coverings, to improve your comfort, production speed, precision or overall efficiency. Installers weigh in again in our Business Tip, with information of how THEY navigate the Coverings show. If you’ve never attended – and even if you’re a regular – you can pick up some pointers about making the most of the experience and arranging your time to mine the show for inspiration gold! 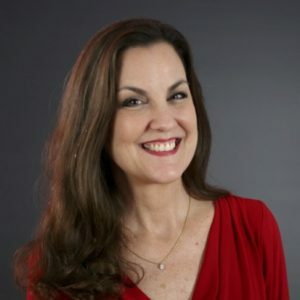 Becky Serbin’s NTCA University Update also gives you some tips for planning your conference strategy in Orlando. 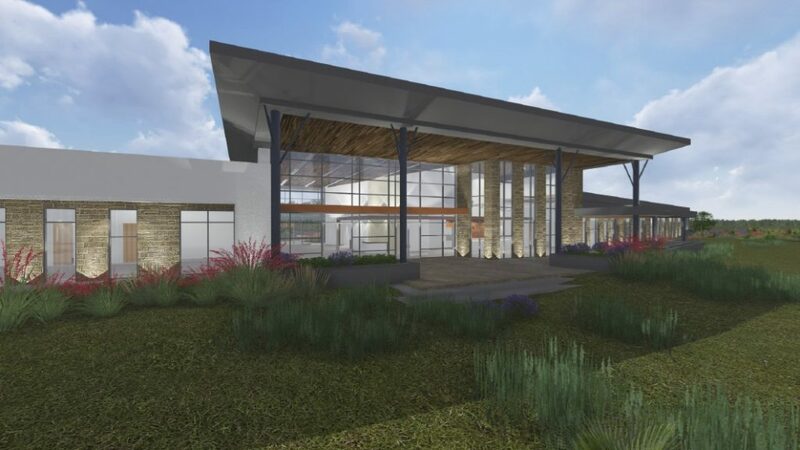 Contractors, be sure to read the NTCA section and the list of demonstrations planned for the TCNA Installation Demonstration stage, including a visit to the new Installation & Design Experience. Every year NTCA works to develop a fuller, richer and more educational experience for its members and visiting contractors and installers at the show and this year is no exception, with education, demos, tours, installed vignettes illustrating the collaboration between designers and qualified labor, refreshments, networking opportunities and even the chance to win prizes all on the roster. Booth #3538 is your go-to location for all things installation, with a satellite NTCA desk in booth #3219 staffed with representatives to answer your questions about membership and the association. I always enjoy feedback on the show and what you found valuable, so please drop me a line at [email protected] and share your thoughts! 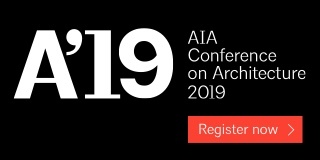 Looking forward to seeing you in Orlando! By now, your Coverings planning should be in full swing. Do you have a strategy for navigating the thousands of square feet in the Orange County Convention Center, and seeing all the education sessions, demos, features and products you desire, while leaving time to attend parties and network with your peers? How do you do it? 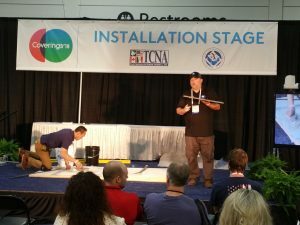 We asked several NTCA contractors about their approach to the show to help you go about creating a Coverings strategy of your own. 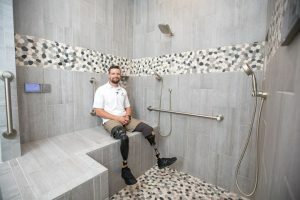 Jason Jones of Jones Tile, Columbia, Ala., went to his first Coverings last year, with the intent of meeting “as many of the crazy characters I’ve met online in person.” He hopes that was only the first of many. His only strategy? Wearing comfortable shoes and wandering around meeting and talking with people. “Also, I enjoy getting free stuff,” he admitted. 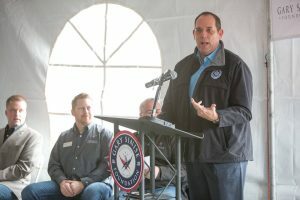 While meandering works well for Jones, Brad Denny, Vice President/COO of Nichols Tile & Terrazzo Co. Inc. in Joelton, Tenn., said, “having a plan is essential.” He recommended having an honest introspective look at your company while going through the list of sessions available to decide what to attend. 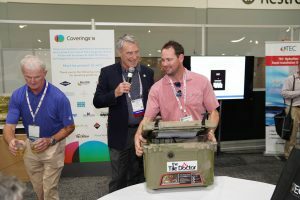 The Installation & Design Experience (last year it was the Installation Design Showcase), NTCA, and CTEF booths have always been draws for Denny. 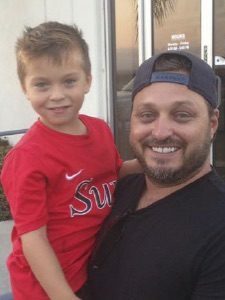 This year he’ll be even more keen on the showcase since his company will be installing a vignette in the Installation & Design Experience booth, paired with designer Glenda Wright of HHCP. He also likes to visit all of his tool vendors and their competitors to continue to cultivate relationships. “When time allows, I like to view the complexity of the vignettes and stay up on the latest trends in the manufacturers’ booths,” he said. Tools in the tile trade are essential items to get your job done. We interviewed a few NTCA members to get their take on their favorite and must-have gear for tile installers. Eibenstock wet/dry hand saw is great gear for John Parulis. John Parulis, of Contractors Tile in San Rafael, Calif., takes it down to the basics, when he says his most important tool is his glasses! In addition to that, Parulis names his must-have list, which includes the obvious 10” tile saw. His other faves are an Eibenstock wet/dry hand saw and cutting table for 48” long material. Orange Aluminum 8’ long tee for layout guide and straight edge work, variable speed grinder, 8” power grip vacuum pumps for large-format tile, Montolit Perfetto CPF 250 razor sharp precision blades, and Dewalt laser layout tool are also on his list. ProKnees, style 0714, are favored tools for Eric Simon. There are tools to use with tile and there are tools that safeguard your body. 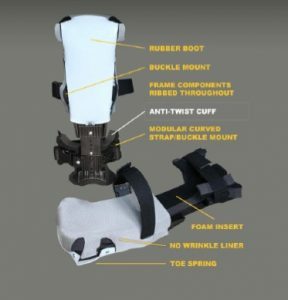 Eric Simon, Simon & Simon Tilemasters LLC, said ProKnee knee pads are the best thing since sliced bread (or tile, in his case). He’s used them for at least 25 years, usually the 0714 style, and said they are “very highly recommended” to any trade on their knees. 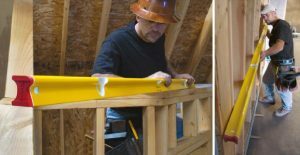 Ken Ballin of Skyro Floors, West Creek, N.J., agrees with the ProKnees, and also names a good snap cutter (Sigma and Montolit are favorites) and a nice set of levels, preferably Stabila R-Beams, as his favorites. Ken Ballin prizes a nice set of levels, preferably Stabila R-Beams. 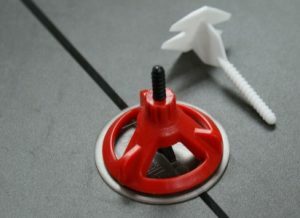 Eliminating lippage with the RTC Spin Doctor Tile Spacers is the way to go for Mike Morley. Knee pads: I prefer the leather kind with buckles. Grinder (with proper blade and technique, you can get away with not using a wet saw often if you choose). My Dewalt wet saw (I use it often anyways despite what I said in point 5). Mixing drill and paddle. I’m using an el cheapo Harbor Freight drill lately and it works juuust fine. One can never have too many buckets. Margin and notched trowel. I use a euro notch more often than not anymore. Flat trowels for pans (along with a wood float for packing). 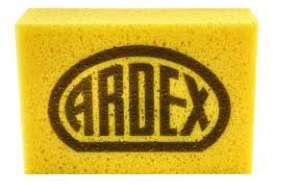 A good grout float and an ARDEX sponge gets the job done for Jason Jones. Lippage clips make my life easier despite what the “old school” naysayers may preach. I like LevTec and MLT. Cordless drill/driver for whatever you have. 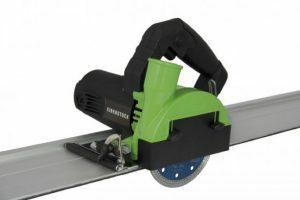 Oscillating saw for door jambs and other needs. A rubbing stone for the rough edges. Did I say buckets? Yeah? Buckets again! 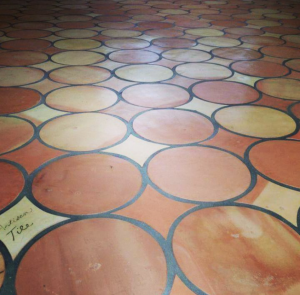 Brad Denny of Nichols Tile & Terrazzo Co., Inc., in Joelton, Tenn., exclaimed, “If anyone else doesn’t say it, I must! From the beginning as a laborer to the end of their career, the margin trowel has been the most useful and versatile tile tool in my tool arsenal. 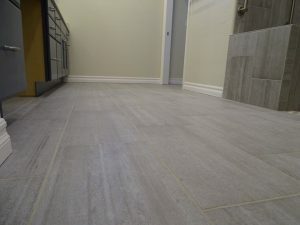 It can clean, butter, pack, mark, scrape, cut, chip, prise, hammer, mix, scoop, and catch…all things a tile laborer, finisher, apprentice, installer, and craftsperson might need to do. I prefer having a sharp 5” x 2” for more delicate needs or tighter places and duller 6” x 2” for more robust needs or longer reach. Marshalltown Dura Soft handles have been my choice for several years. A Lufkin X46 Folding Rule with a 6” slide out helps Brad Denny on his jobs in a myriad of ways. The Montolit P3 series Masterpiuma manual tile cutter is a versatile tool for Jeremy Waldorf. 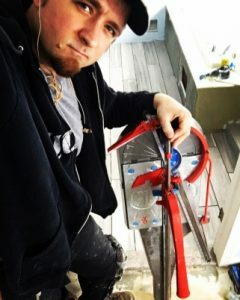 For Jeremy Waldorf of Legacy Floors in Howell, Mich., Montolit is his #1 tool brand and prized tool is the P3 series Masterpiuma manual tile cutter. Waldorf started out as a “wet-saw guy” and logged millions of steps running up and down stairs on each job, even to make simple cuts. But some of his friends used snappers and grinders and rarely used their wet saws. 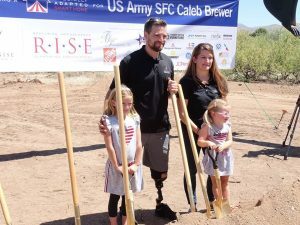 Though 2019 got started last month, the impact of some programs and events aren’t really being felt until now. 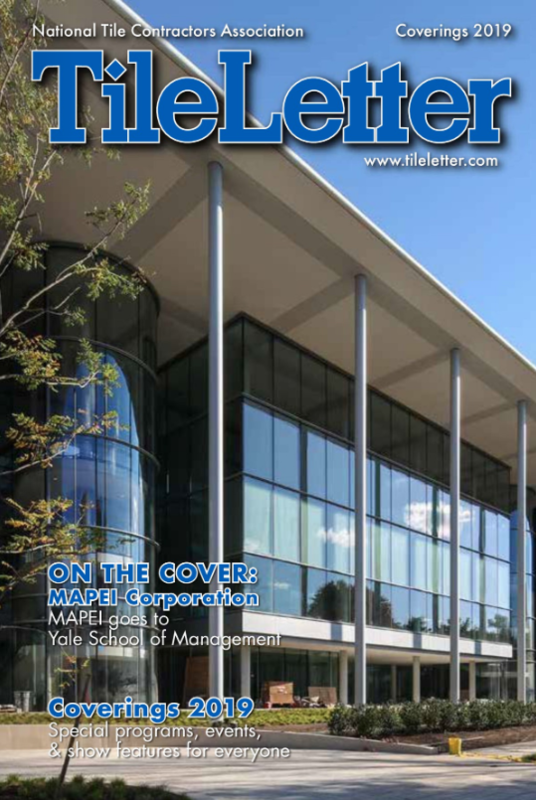 Hopefully by the time you receive this magazine, you will be either at TISE or have recently returned, armed with new industry contacts, and inspired by new product ideas and information gleaned from conference sessions to power you through ’til Coverings! NTCA has a new configuration of training opportunities for 2019. Over 100 free NTCA Workshops will still be coming to a location near you for three evening hours of camaraderie, good eats, industry information on standards and avoiding failures while offering hands-on demonstrations of new materials and methods. But in 2019, NTCA will visit select cities for a week-long “NTCA Training Experience” that combines a traditional NTCA Workshop open and free to all interested industry professionals, a free regional training event available to NTCA members and their employees, and a free open round table discussion for NTCA members to allow sharing of ideas, challenges, business tips, problem solving tips and more. 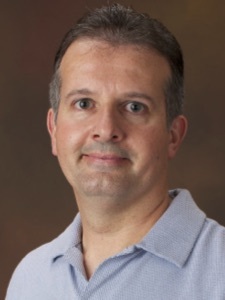 For details, see Bart Bettiga’s story in our Training & Education section. Short of bringing education to your living room (which actually is what the online NTCA University enables us to do! ), NTCA is pushing even harder to be sure there is accessible, free training to more areas of the country than ever before. Take advantage of it! And if you have an opinion, or would like to read those of others, visit our new NTCA Forum, a blog that we just rolled out in January. We’ll post articles and information and invite you to share your thoughts. 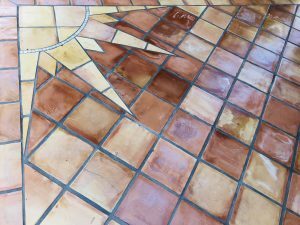 February hosts National Tile Day on the 23rd. In honor of that, Avia Haynes has penned a story about how the Why Tile initiative is such an important one and how you can tie into it in your business. 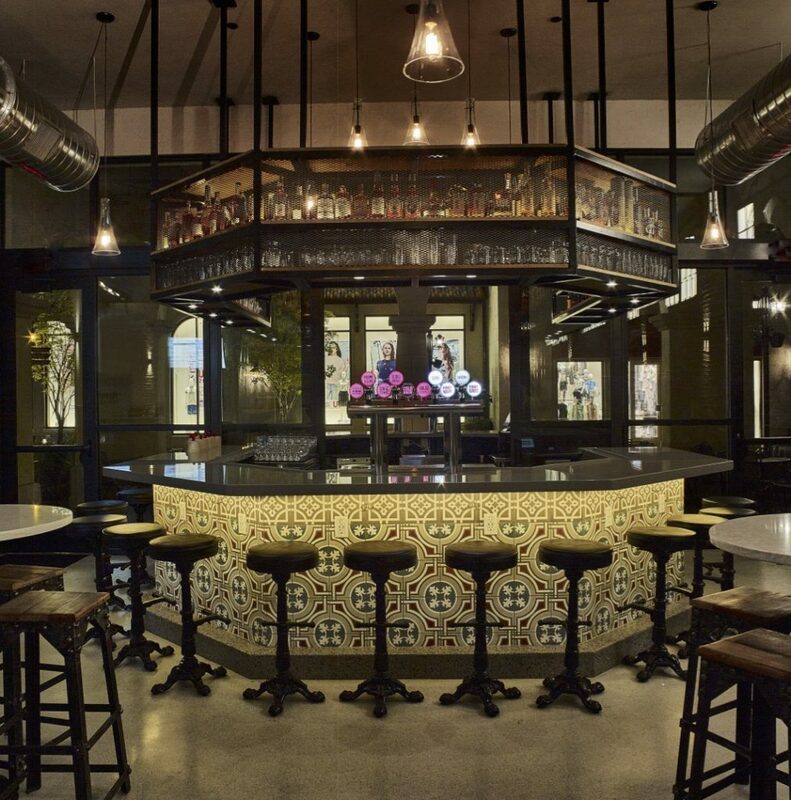 Be sure to visit TileLetter on Facebook on February 23, to witness the beauty and installation excellence that National Tile Day is designed to celebrate. If you’ve been a tile setter for any length of time (or even if you just sit at your desk all day like me), you may be prone to health issues affecting your back. 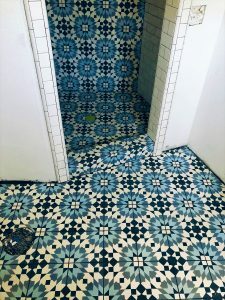 A discussion on the Tile Geeks Facebook group took place about this very topic at the end of December, and members of that group have graciously agreed to share their experiences, tips and comments with the larger TileLetter audience in case their experiences might help a fellow tile setter. Our Tech Talk article features essential wisdom about installing tile in wood frame structures. This is a story you don’t want to miss, especially if you are located on the East Coast where wood-frame homes are common. 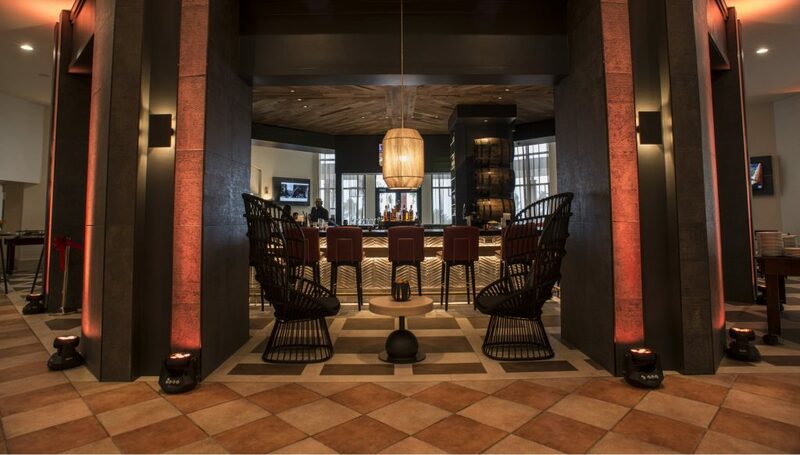 Finally, take a gander at our Coverings preview that will give you a taste of what is to come April 9-12 at the Orange County Convention Center in Orlando. 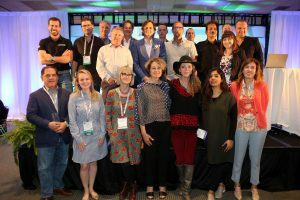 There are some changes to this year’s offerings that will set the stage for exciting opportunities to learn, connect and be inspired! Hope to see you there! This grabbed my attention immediately, since I’ve had a personal encounter with “severely narrowed” L5 and L6 vertebrae immediately after Coverings 2018. Six weeks of physical therapy that evolved into a daily yoga practice and dropping over 20 lbs. have worked to keep my back mostly pain free (and kept me out of the surgeon’s office). 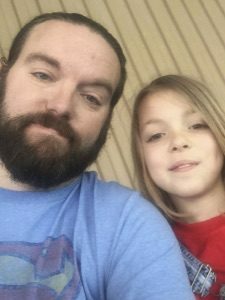 So I was interested in the flurry of over 60 responses that ensued to Dan’s question. 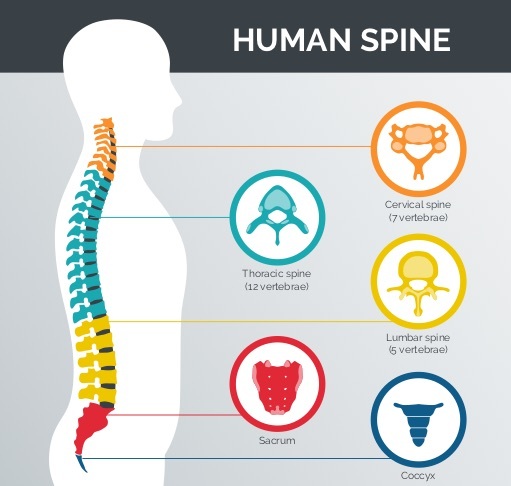 Clearly, back problems are something many tile setters deal with on a frequent basis, and there is a wide range of various responses and remedies from surgery to prayer – that tile setters are employing – some resulting in great improvement and some that don’t make much difference. Note of caution: this article is not meant to prescribe medical treatment, only to provide some ideas and insights to follow up with your doctor or healthcare professional. But surgery isn’t the end-all and be-all solution for some. 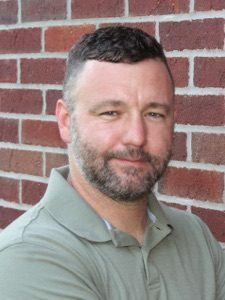 David Swim of Swim Bros. Building and Remodeling in Ashland, Ky., has three bulging discs, plus the aftermath of a two disc-bone fusion in his neck from ’08. “The surgery helped for a couple years but things started going bad again,” he said. Swim toughs it out to avoid pain meds. “If it gets terrible, I use ice and heat in the evenings on and off and a brace during the days,” he explained. Craig Griffin, of Griffin Tile & Stone, Griffin Const. 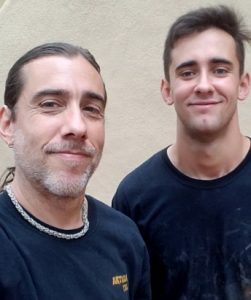 Group and an independent Florida tile setter, started as a tile helper in 1980, and has had “way too many years of body abuse.” He sees a chiropractor twice a week. Another tile setter steps up his chiropractic visits in the acute phase until healing starts to happen, even going for daily visits for several months. Oliver Ledbetter of Little Tile Guy, LLC in Hickory, N.C., plans on “chiro” every Friday afternoon, then a hot shower and ice before bed. “I don’t have a bulging disc but am in recovery from a slipping one,” he explained. Paul Joseph of Precision Plus Home Remodelers, Inc., in Port Washington, N.Y., is the not-so-proud owner of six herniated discs, but he credits a combination of supplements with keeping him pain free for 10 years. His potion? Twice a day doses of magnesium 64 mg, 720 mg turmeric, and four Wobenzym N® pills daily. He also uses a TENS (transcutaneous electrical nerve stimulation) machine to help alleviate spasms. In addition to supplements, Pablo Marticorena, of Pablo Tile Installer in Chippewa Falls, Wis., advises drinking water – and lots of it – to help with back issues. There’s a strong case for staying hydrated. My own physical therapist explained that layers of muscle and fascia slide over each other when you move. Keeping your body hydrated allows them to glide easily, but if you’re dehydrated, they “stick” and can cause pain. From MW Rouzer LLC in Sussex, N.J., Stephanie Rouzer’s tile setter husband had success with a chiropractor and anti-inflammatory eating. “It’s kept him off drugs and out of surgery,” she added. Hanging upside – and other forms of decompression and traction – offers relief for many. 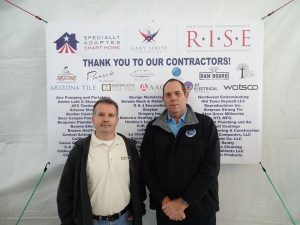 Michael Edward Baczynski of Deluxe Improvements in Avilla, Ind., and Jack Stallings of Imperial Tile and Marble, Inc., in Phoenix, Ariz., find inversion tables helpful for taking the pressure off the vertebrae. 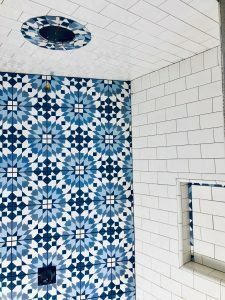 Drew Finch of A&D Tile in Columbiana, Ohio also used a TENS machine in conjunction with three weeks of physical therapy and massage to heal from a back issue. 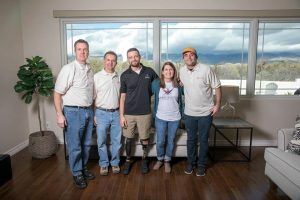 Neal Holden of Riverside Construction, LLC in Yakima, Wash., has issues with his L3 and L4 vertebrae, but fights it with water for hydration, going to the gym three times a week with a focus on the core muscles, and chiropractor visits until they dwindle to only a weekly tune up. Kenny David Gonzalez of Phoenix International Consulting, INC, Long Beach, Calif., recommends buying the book, The Gift of Injury. “It shows you good exercises to help dramatically,” he said. Some setters use Percocet for severe pain, and have had some success with medical marijuana or CBD oil, sometimes in combination with yoga and stretching. Dan Chamberlain was wowed by all the responses to his query. “I didn’t think that there would be so many going through the same issues,” he said. “I have already been doing the massage therapy, chiropractor and a little acupuncture.” He admitted he already drinks a lot of water, and will look into the supplements mentioned.